The sensual tension between Gucci Guilty’s rebel love duo is recalled in the hypnotic glint of a diamond. A covetable jewel that exudes power and beauty. The Gucci Guilty Diamond flacons wrapped in lustrous gold hued metal, glass windows in an entwined G design reveal the scent within. Gucci Guilty Pour Homme’s flacon features a glass top fluidly attached to its metal base, while the profile of Gucci Guilty Pour Femme’s bottle shows a rich, amber-hued juice. Diamond crystals inset on the consummately crafted flacons glimmer with provocative promise. Matte black outer packing radiates with Gucci’s unmistakable gold entwined Gs. 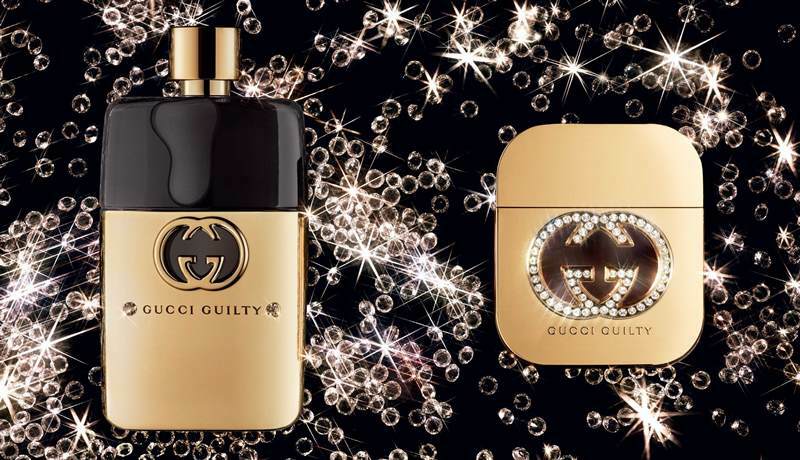 Gucci Guilty Diamond Pour Femme and Gucci Guilty Diamond Pour Homme feature the unparalleled olfactory makeup of heady, seductive and thrilling original Gucci Guilty scents. Gucci Guilty Diamond Pour Femme is a warm yet striking oriental floral with hedonism at its heart. Asserting its sensual presence with an opening hit of pink pepper, the scent summons with aphrodisiac middle notes including lilac and cardamom, and closes with voluptuous amber and the suggestive pulse of patchouli. Sharing the intoxicating character of its feminine counterpart, Gucci Guilty Pour Homme is an intense and aromatic contemporary fougère designed to provoke. The scent seizes the senses with invigorating Italian lemon and mandarin top notes, crushed green leaves and punchy pink pepper. An alluring heart of lavender mingles with warm coriander, orange flower and neroli, layered over a masculine base of cedar and patchouli that intrigues and seduces.